Elsipogtog First Nation, NB – Sylvester Copage, 78, of Elsipogtog First Nation passed away peacefully at the Georges Dumont Hospital, Moncton, NB on Friday, April 12, 2019. Born in Elsipogtog (Big Cove) he was a son of the late Stephen and Mary Elizabeth (Clement) Copage of Elsipogtog NB. Sylvester was a life-long member of the Elsipogtog Ste Anne Parish Church. Sylvester is survived by his beloved wife Doris (Levi) of 54 years; Much loved and respected by his adult children: 5 sons: Brian (Sally), Junior, Jody (Loretta), David, and Stevie (Angie); 2 daughters, Mary Ann and Noreen (Barry), and 18 grandchildren and 9 Great Grandchildren. Will be missed by sisters: Margaret Rose Copage, Nancy Swift, and Mary Agnes Copage. Sylvester will also be affectionately missed by his second family "the Augustine’s known as OK’s." 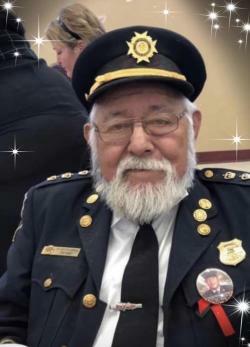 He was predeceased by his parents; and 3 brothers: David, Stephen John, and Raymond; 1 sister: Veronica; 3 grandchildren; and Stephen OK, Norman OK, Pat OK and Mary OK.
Sylvester was a long time and respected employee of the Elsipogtog Band as a Fire Chief. He was instrumental in getting the Fire Department established and within a couple of years started the Ambulance as a part of the emergency fire services. He served as a Fire Chief and a Paramedic until his retirement. He was successful in having the "National Annual Indian Fire Fighters Competitions" held in Elsipogtog. He volunteered in minor sports, as a coach for many years and often made sure the players were equipped and got to their games and tournaments. Sylvester was especially proud of his sons, who named their fishing boat in respect of their dad, "Sylvester the Cat" and made sure he was at the wharf when the boat came in at the end of the day. If it is your wish, donations in Sylvester’s memory may be made to the Dialysis Unit at the Dr. Georges L. Dumont Hospital would be appreciated by the family. A special thank you to Sylvester’s caregivers from the Elsipogtog Home & Community Care. Also the many Nurses and Doctors at the Dr. Georges L. Dumont Hospital, especially at the dialysis Unit and during his last days at the 4th floor. Visitation will be held at his home on 160 Main Street, Elsipogtog, NB on Monday, April 15th, 2019 beginning at 2pm until the day of the funeral services on Wednesday, April 17th, 2019. A Funeral Service will be held at the Ste Anne’s Parish Church on Wednesday, April 17, 2019 at 2PM officiated by Father Raymond Desjardins. Interment will be held at Elsipogtog Cemetery following the service. Arrangements are in care of Thompson’s Funeral Home, Richibucto (523-4252).